It’s almost a week since SilentMode’s Store Crawl 2017 was completed. (Spoiler alert: I came back in one piece!) I’ve since returned to work – both the day job and on Swapfig – and have caught a cold in the process. When I feel compelled to throw in the towel and move on, I think back to the movie Cool Runnings. Even if winning is no longer a possibility, I must finish the race. Anyway, let’s cast our mind back to the last day of the Store Crawl, where my first stop was at the old flagship store in Bluewater shopping centre. You can catch a slower train from London Bridge to Greenhithe, and if your ticket says Greenhithe for Bluewater you can use the same ticket to catch a bus to the shopping centre. Alternatively you can catch a faster train from St Pancras to Ebbsfleet International, however the bus journey to Bluewater is much longer. Other than the shopping centre, there’s not much to speak of in the area. It’s another location for new build luxury apartments and “privileged” school kids. Before the Westfield store opened, I made the journey to Bluewater on weekends just to check out the PAB wall. Like in Brighton, the Bluewater store has changed location within the shopping centre over time. This resulted in a slightly smaller PAB wall, and generally a diminished selection of parts. … Well look at this! 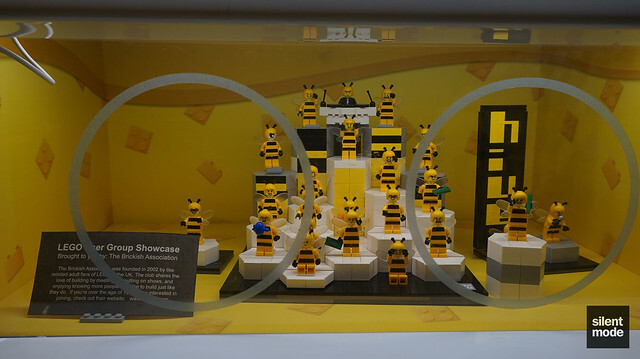 It turned out I was just in time to see The Hive (by yours truly) in the showcase. The showcase coordinator had installed it, hence the unusual configuration. This MOC has been in the showcase for some time, and was due to be replaced. 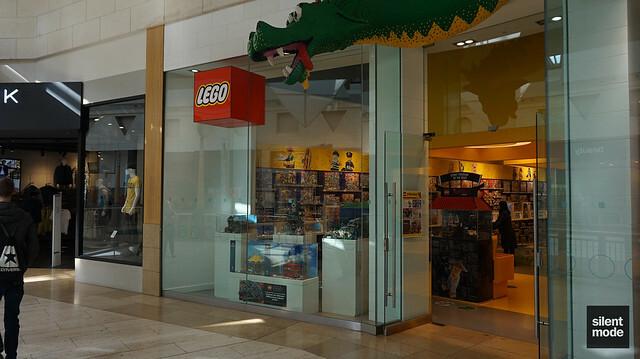 This is its second appearance in a Lego store, and it has reportedly gone down a treat. As usual, photos of Bluewater’s PAB wall can be found in the dedicated Flickr album. It had been a very long time since I’d visited the Bluewater store. In fact, I think the last time I’d been there was during the launch of the Exo Suit. The staff seemed friendly and attentive from the beginning. I was my usual inconspicuous self, once again removing my jacket for effect. It was then that I’d bumped into a familiar face: the Bluewater showcase coordinator and London AFOLs co-organiser. The first was that, while filling a large PAB cup, I was allowed to go into the storage room to look at available parts. This was the first time I’d ever set foot in the back of a Lego store, and that was special enough. The second was being given me a couple of old promotional sets as a gift. I won’t mention what these sets are, but the word is they had enough of them going spare. Let me stress that I wasn’t doing the Store Crawl with the intention of getting freebies, or anything other than recognition. However, I really appreciated the gesture, and it made my day. Thank you Bluewater staff! The last part of the progress report is going to cover the three London stores. Since the remaining stores are all in London, there’s no point in having separate posts for each.